Mobility has immeasurable potential and apps are fueling that potential to make sure best services can be provided to the users. Insightssuccess took this issue up and brought into limelight those companies, from India, who were carrying the whole industry on their shoulders. Applications have become a phenomenon in this smartphone friendly world. But the apps that actually become the life and soul of these smartphones; don’t come out of nowhere. Companies upon companies work hard; day and night, to make their hAPPy venture a success and it is after this sort of a tremendous effort that apps are made. Valuing people and companies who make sure that these apps are made flawlessly and delivered to you is important. Insightssuccess took up the task and to give value to those who add value to others lives. 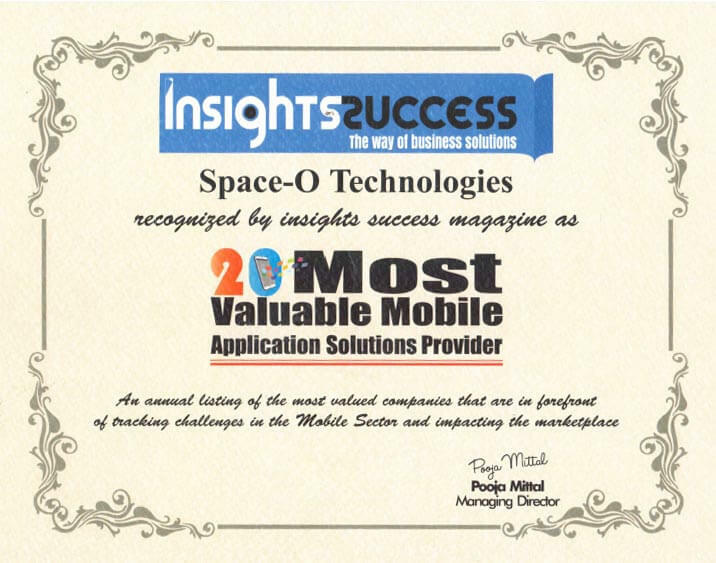 The July, 2015 issue of Insightssuccess brought a pleasant list of 20 companies that provide brilliant mobile app solution; and one of the 20 companies was Space-O Technologies. 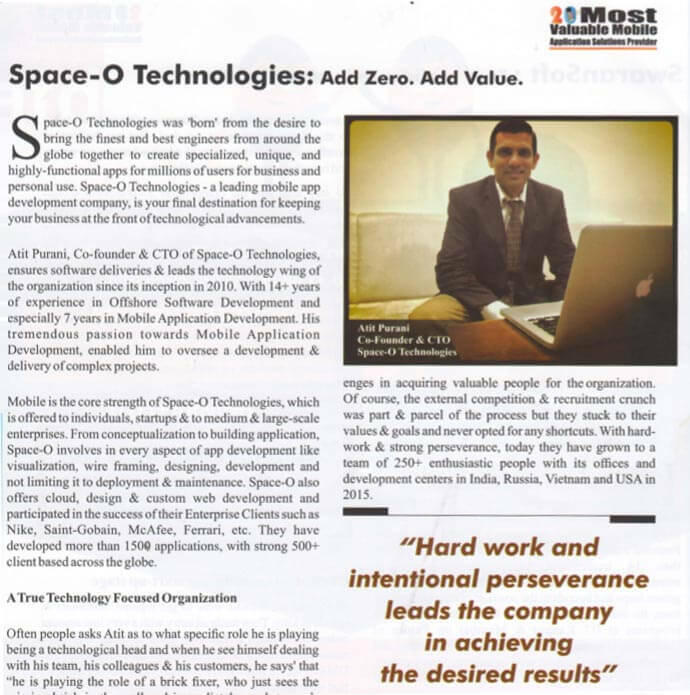 Mr. Atit Purani, Co-founder and CTO of Space-O Technologies, had a talk with the reporters telling them what this 5 year old startup is all about. This interview also gave insights about the beliefs that Space-O technologies keeps. It’s core belief in bringing together the best engineers, developers, designers and other professionals on one platform to make sure Space-O can become a one-stop solution provider for anyone who needs the assistance; with hard work and perseverance.